Paperback: Choose Vendor... Pre-order here! Please put personalization information or "Signature only" into the Order Comments. 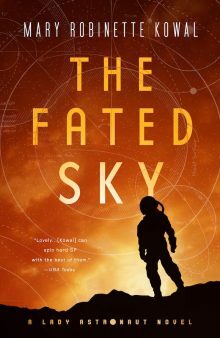 Continuing the grand sweep of alternate history laid out in The Calculating Stars, The Fated Sky looks forward to 1961, when mankind is well-established on the moon and looking forward to its next step: journeying to, and eventually colonizing, Mars. Of course, the noted Lady Astronaut Elma York would like to go, but could the International Aerospace Coalition ever stand the thought of putting a woman on such a potentially dangerous mission? Could Elma knowingly take the place of other astronauts who have been overlooked because of their race? And could she really leave behind her husband and the chance to start a family? This gripping look at the real conflicts behind a fantastical space race will put a new spin on our visions of what might have been.